The shape of this bottle is very rare, as most cylindrical bottles from the mid-Qing period, when this range of forms became popular, tend to have a more prominent neck. 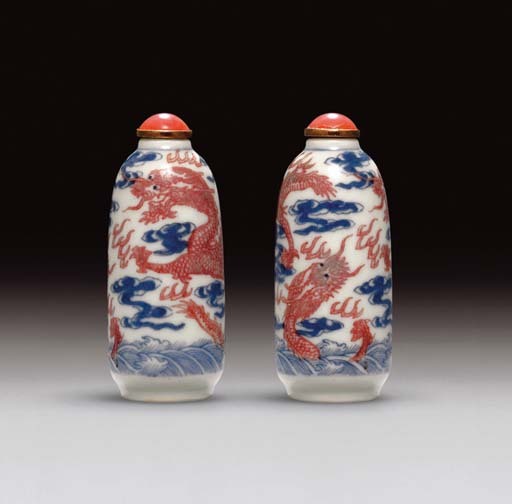 Although unmarked, the bottle is typically Imperial both in subject matter, with its five-clawed dragon, and in style (see, for instance, lot 601 for a Qianlong-marked example in similar coloring). An almost identical bottle is illustrated in a volume of snuff-bottle illustrations that accompanied the catalogue publised in 1874 by William Bragge, Bibliotheca Nicotiana. A Catalogue of Books about Tobacco together with a Catalogue of Objects Connected with the Use of Tobacco in All its Forms, formerly in the J & J Collection and sold in these rooms, 22 March 2007, lot 20 (also illustrated by H. Moss, "The William Bragge Illustrated Album", JICSBS, Winter 2006, p. 15, fourth row, fourth column).